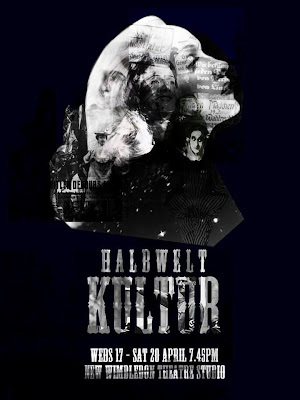 Halbwelt Kultur, the latest piece from PK Productions, was originally devised as pre-show entertainment to Rufus Norris’s production of Cabaret in 2012. As a companion piece the influences are clear, but now the show stands alone as a work in progress – part cabaret show, part musical. It is an ode to the cabaret stars of the Weimar Republic: seven key figures chosen to represent the strength of womankind in a male dominated time of war and strife. “Men are the problem with humanity”, they sing in the opening number – but are women the solution? What Halbwelt Kultur does so well is replicating the mood of the period. The scene is set up in pre-show by the cast, whilst an on-stage band provide musical accompaniment and instrumental interludes between scenes. The musical pieces are well chosen and much of the script is quoted verbatim - it’s clear that much research and thought has gone into the production as a whole. Structurally, the show is a cabaret in itself, divided into seven distinct vignettes to allow each performer their moment in the spotlight. These range from celebrated cabaret artist Blandine Ebinger and cross-dressing Claire Waldoff, to the expressionist performance artist Valeska Gert and the Marilyn Monroe of Germany, Marlene Dietrich. These vignettes present merely a snapshot of each of these women’s lives and, at present, feel a little disparate. What’s perhaps needed is a stronger thematic link between each scene, beyond simply female cabaret performers of the Weimar Republic, or a clearer narrative thread to drive the audience’s investment. As it stands, these are seven interesting, but separate, scenes that don’t quite hang together. Alyssa Noble’s sexually alluring yet cheeky choreography was well performed by a mostly strong cast. The vignettes of the second act were more successful owing to more distinct characterisation – the vampy Noble as Valeska Gert; the provocative yet self-destructive Anita Berber played by Samantha Clark; and some solid singing from Kathleen McNamara as Gabriele Tergit. Director Padraig Kennedy has sought to present the real women behind the cabaret personas, creating an almost cinematic quality between natural and performance modes. Yet these women are well known for their debauched and daring performances that pushed the boundaries of acceptability, whereas the performances in Halbwelt Kultur lack that same dynamic. Certainly the show subverts our expectations, but it could afford to be braver in its eroticism. With such a rich history to draw upon, there is much that could be incorporated into the show to expand upon the context of each vignette and the individual characteristics of these inspiring women. Halbwelt Kultur is undeniably an exciting prospect, with further development planned. As it stands, the show is a tantalizing tease of its full potential. Watch: Halbwelt Kultur runs until Saturday 20th April at the New Wimbledon Theatre.